The work session began a review by Department of Marine Resources (DMR) biologist Heidi Leighton of the way that the experiment was laid out on the clam flat in John Small Cove. The overall question behind the study is how towns might inexpensively cause more wild clams to settle on clam flats and grow to harvestable size. 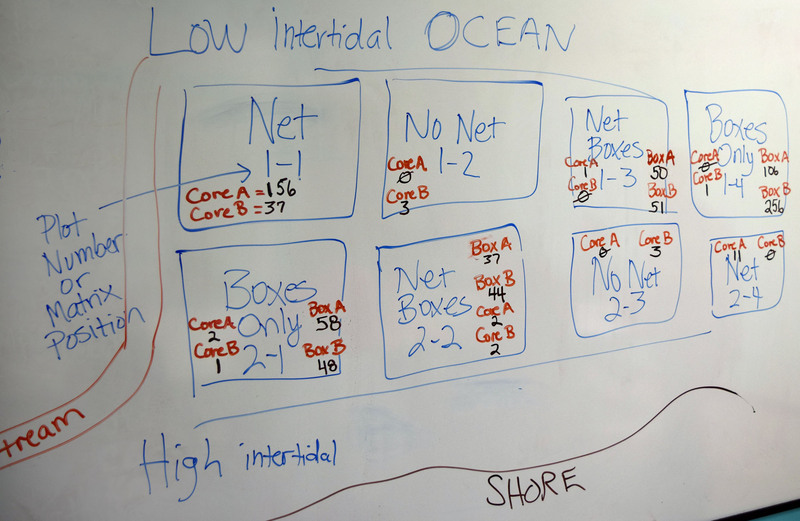 The different rectangles that Heidi has drawn on the board in the picture below represent the different experimental plots; each plot corresponds to a different treatment condition: settlement boxes or not, protective netting or not, higher on the tidal gradient or lower. 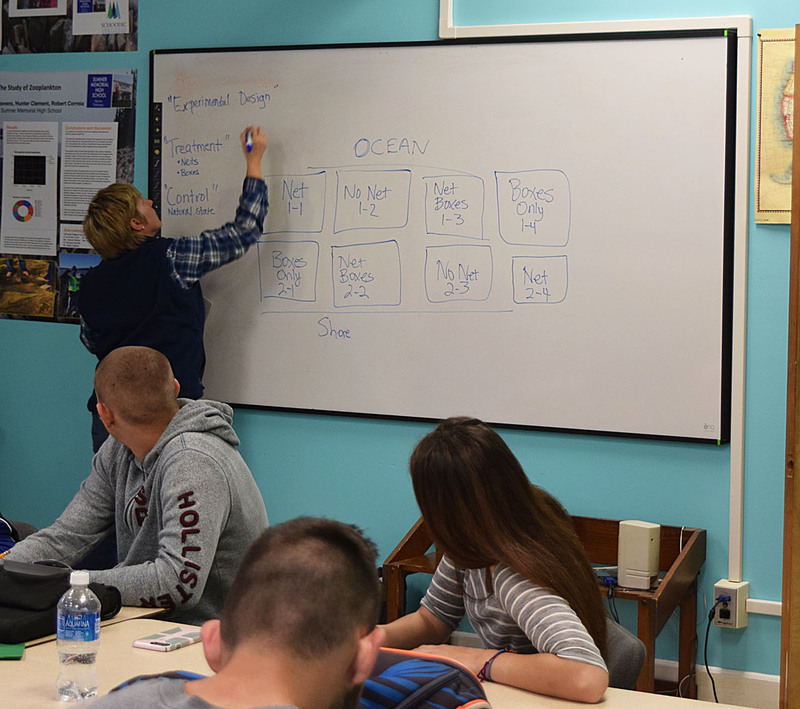 Heidi and Susan Walsh, a teacher in Sumner’s Pathways program, engaged the students in a conversation about where the students thought they would find the largest number of juvenile clams, asking the students to explain the reasoning behind their thinking. The students’ answers varied: some thought the nets would help, others thought they might get in the way. Some thought the boxes would increase settlement, others thought that the obstruction that they created would interfere with settlement. A little background about soft-shell clam reproduction and development might help in understanding the thinking behind this experiment. In eastern Maine, male and female soft-shell clams release sperm and eggs into the ocean once a year. Timing varies with water temperature, but sperm and eggs are typically in the water column from June through August. Fertilization takes place as eggs and sperm float in the ocean. The resulting larvae begin to develop an early form of a shell in a day or two. At that point, they are called “veliger larvae.” Veligers feed on phytoplankton and can swim, but are also moved around by ocean currents, wind, and waves. There can be a lot of veligers, which is why they are an important food source for fish: a Fish and Wildlife Service study reported densities of more than 1,000 veliger larvae per cubic meter in samples collected off the coast of Maine. The clams stay in this larval form for a few weeks and can travel a long way from where they started. They grow as they feed and travel, and when they reach a size of about 0.2 mm their shells begin to thicken and they begin to settle out of the water column. They can still move around at this point, and they use that ability to find places with less wave action, good food sources, and mud or sand that they can burrow in. They do not burrow very deeply at this stage, and so can still be subject to wave action that moves them to other places. Above is a picture of the settlement boxes that were at the heart of the study. Heidi’s conjecture was that the boxes would disturb the water flow as the tide and waves came in, creating eddies and slowing the water down so that the juvenile clams would settle out of the water and into the boxes. This conjecture grew out of the experience of clam diggers, who have noted that there are often more clams around rocks and other obstructions on the clam flats. A second conjecture had to do with predation: small green crabs eat small clams. So, in some of the experimental plots, 12-foot square nets were stretched over the boxes. Since the clams are only about a fifth of a millimeter across when they begin to settle, the idea was that the mesh would allow the juvenile clams to settle into the boxes while keeping crabs out. After the students helped Heidi and shellfish warden Mike Pinkham collect the samples on October 27, Heidi washed and sieved the samples to separate the clams out from the mud. She placed each sample from a settlement box or a core sample into a separate plastic bag. 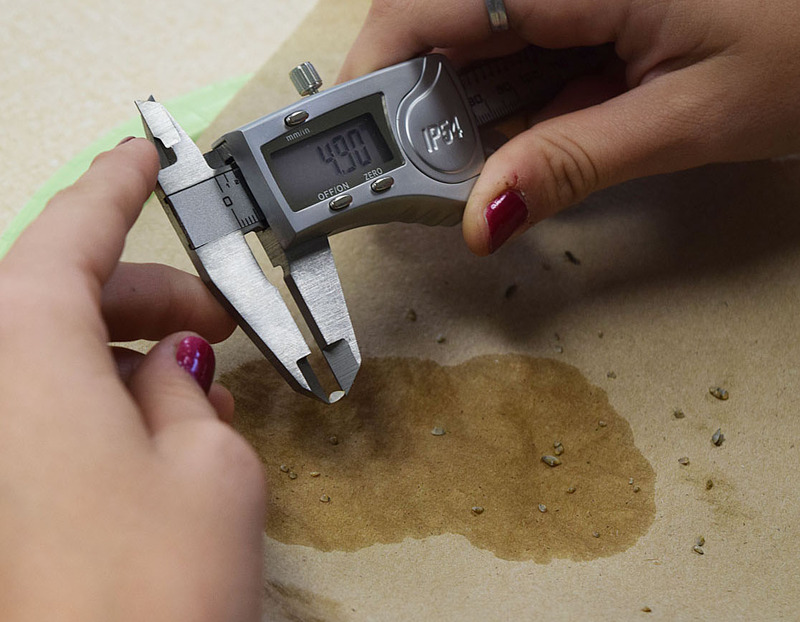 The picture up at the start of this post shows the students working in pairs, one doing the measuring with digital calipers that measure down to hundredths of a millimeter, the other recording the size of each tiny clam. The picture below shows that this was exacting work. The clam in this picture was actually one of the larger ones, measuring 4.9 mm. Notice that there are others on the paper towel that are much smaller. As someone who has worked with and observed high school students for years, the students’ interest in sticking with this task was a little surprising, but less so now that I have gotten to know these students a bit. Many of them already work to support themselves or to help support their families. My perception is that paying attention to detail and working until a job is done is something that is familiar. Further, all but a few of these students had been at John Small cove in late October, helping pull nets, collect samples, and clean equipment. Heidi’s whiteboard drawing of the arrangement of the experimental plots was not an abstraction for these students; they were able to visualize what Heidi was describing. They had observed the holes in the mud after the nets had been pulled, holes caused by clam siphons reaching up to the surface. It seems possible that the students’ interest in the work was at least partially related to their having participated in it and their ability to put it in the context of a particular place and event. Below is a picture of the final counts for the boxes and core samples, posted on the whiteboard. These are just counts and do not reflect all the measurements that the students did; the students will have to key the measurements into a spreadsheet before we can do anything with them. But just looking at the counts was interesting and a little surprising. 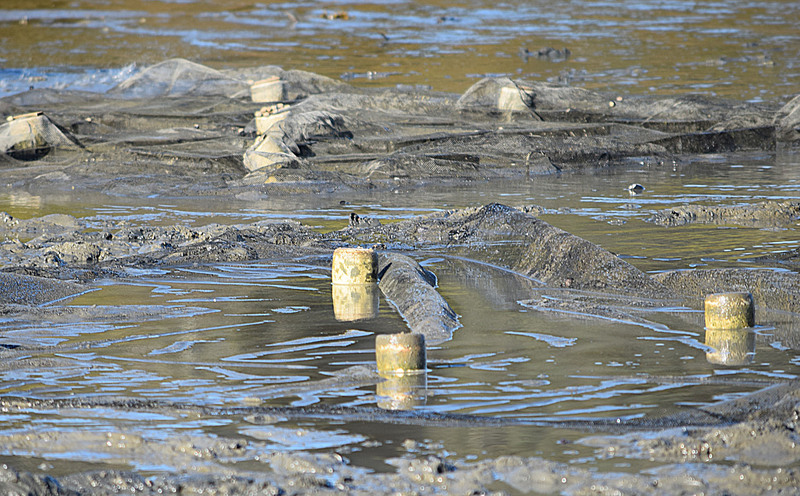 What was NOT surprising, but reassuring, was that we did see evidence of clam settlement into the boxes. But what WAS a little surprising was that the boxes that were not covered by nets had higher numbers of juvenile clams than the boxes that were protected from green crabs. Why? Another idea is that the nets might be changing the way that the boxes affect the water flow. Below is a picture of the boxes while they were still under a net. The boxes are still sticking up in ways that might slow the water down and create eddies, but a comparison between this picture and the one above, of boxes without nets, suggests that there might be a difference in the way that the two setups change water flow. Helping students get past the idea that science is about getting closure and about unambiguous answers is important not just to keep them from getting discouraged about this project, but also because, whether or not they choose to pursue a scientific career, it is important that they understand that science is tentative, that it sometimes moves forward slowly, sometimes jumps ahead, and sometimes even turns back to revisit questions. It is important that they come to understand that not being sure is not the same as not knowing anything. Heidi is a professional biologist who has been doing field work for a long time. She is excited about the work that she and the students did. I listened as she presented the early results to the Gouldsboro shellfish committee after the students finished the counting and measuring. She thinks it is really interesting that the unnetted boxes did so well. Putting out nets in the spring is hard work, as is pulling them up in the fall. Is it possible that towns might improve settlement just by putting out boxes without having to mess with nets? Should towns perhaps put out settlement boxes one year, dump out the settled clams in the fall, and then put nets over the whole site the next year to protect the clams while they continue to grow? The apparent success with these boxes now has her thinking about other kinds of structures to induce settlement. Dr. Brian Beal of the Downeast Institute is using a simple, shallow box with a finer mesh that is just built into the box, top and bottom, rather than using a 12 foot square net that covers all the boxes. Would that work better? 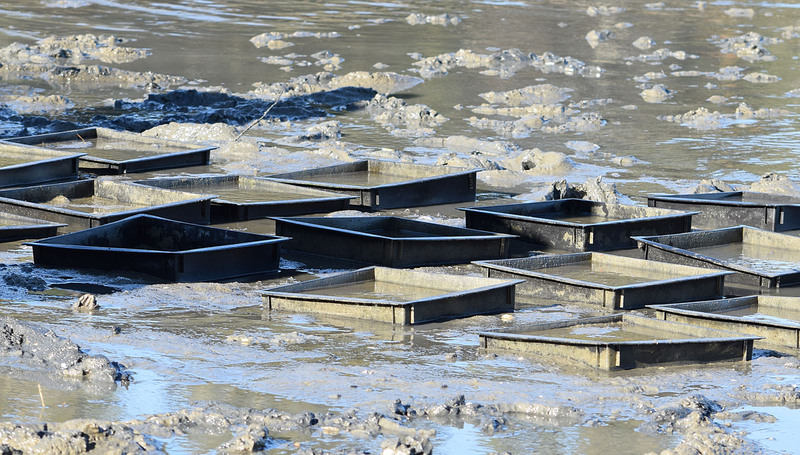 She is also thinking about ways to put less mud into the boxes, which would make it easier to flip the settled clams out of the boxes without covering them with a suffocating layer of mud. Most important: Bring the students into the discussion. Get them thinking about how this work suggests other things that we need to know. When they don’t have ideas about this or questions at the start (and they often will not), resist the impulse to suggest questions. Give them time to ponder (but with an expectation that they WILL come up with things they wonder about). If necessary, get them started by asking them what they think is going on — by asking them to offer an explanation for the findings. Then ask them … and their student colleagues … “How could we find out whether that is true?” When they respond, do not evaluate their answers. Either just write their ideas down, or ask other students whether they have anything to add to the idea. Work to get the students asking each other, “How could we test that? How could we find out?” This should not be a question that is reserved for adults to ask. Distinguish between “Why do you think that?” and “How could we find out if that is true?” For our purposes here, the second question will usually be the better one. Just as we expect the students to think about ways to test their ideas and explanations, resist our own impulses as adults to say “I know what is going on” — what we really have are conjectures that need to be tested. We need to recognize that too. Keep a shared record of conjectures and possible explanations, and of ideas for testing them. The students should all have access to this shared record. There will be too many conjectures and explanations to test. Are there ways we can test several at once? Can we agree on the ones that seem most important to test first? These are issues for the students to sort through. Be clear that since Heidi, Kyle, and Mike are doing this work as part of their jobs, they have the privilege of identifying questions that need to be explored in next year’s work. But, be sure that we also can, within reasonable limits, implement the tests and experiments that the students devise. It is through this process of following the data where it leads, coming up with new questions and conjectures and devising ways to explore them, that we can begin to introduce students to what science is really about. But this is a different way to teach science, one that requires different approaches to instruction. What do you think of these ideas? Do you see problems with them? Do you have suggestions about how to improve them? Leave a comment below or write me at bzoellick@schoodicinstitute.org. A 1986 US Fish and Wildlife Service Service report titled “Species Profiles: Life Histories and Environmental Requirements of Coastal Fishes and Invertebrates (Mid-Atlantic): Softshell Clams” provides a thorough, useful overview of the softshell clam lifecycle and environmental requirements. It is focused on clams in the mid-Atlantic region where there are two spawning cycles rather than just one as in Maine, but it is otherwise a good introduction to the biology of softshell clams in our area.